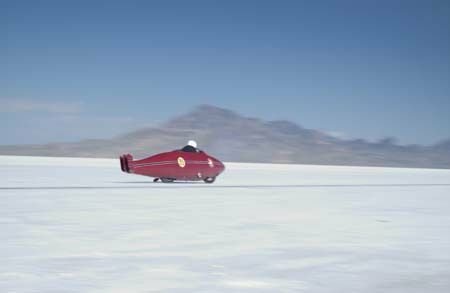 Anthony Hopkins as Burt Munro. The film industry is a fickle animal. It serves up such dire examples as Casanova and The Pink Panther, creating a feeling of desolation so pure you are sure you will never go to the cinema again � and then suddenly a door opens and the sun shines through it. 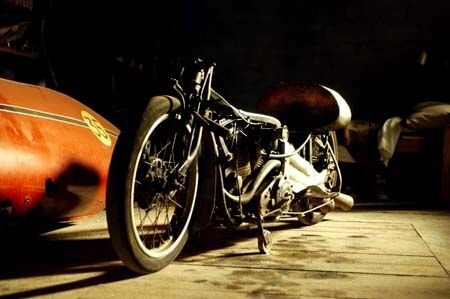 And sunshine this film, The World's Fastest Indian, is. Directed and written by Roger Donaldson, co-founder of the New Zealand Film Commission and filmed in New Zealand and the USA, this film is a breath of fresh air in an otherwise stagnant industry where good scripts are the exception rather than the norm. I nearly didn�t go to see it and that was due to the poor name, I thought it was a bio-pic about a long forgotten Madras 100 metre runner, or an Arapaho brave who made a living by selling cures for baldness or anti-atupid pills to Middle American tourists. The truth is no less bizarre. 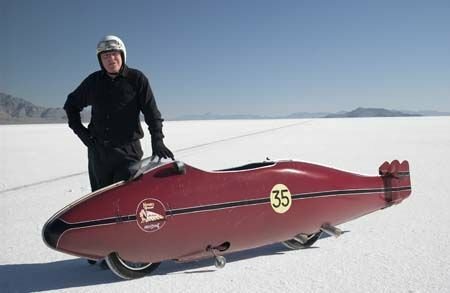 The film follows the later life of New Zealander Burt Munro, who strove for years to build a motorcycle to break the World Land Speed record for the class. This is where the name comes from, the motorcycle in question was a 1920s vee twin engined Indian, originally designed for a maximum speed of around 60mph. Munro thought he could make the machine travel more than three times that speed and although it sounds too incredible you constantly have to remind yourself that this is a true story and most of the script was validated by Munro�s surviving family. I�m a bit of a bike nut but you don�t have to like bikes to enjoy this movie, in truth the film isn�t about bikes, it�s about the passion and energy of a unique and unusual old man who kept focused and energised to reach an almost unachievable goal. The movie takes place in the 1960s and it certainly has a nostalgic feel although there are quite a few mistakes concerning contemporary issues but all in all it looks and feels like 1962. Break out the Werthers Originals. 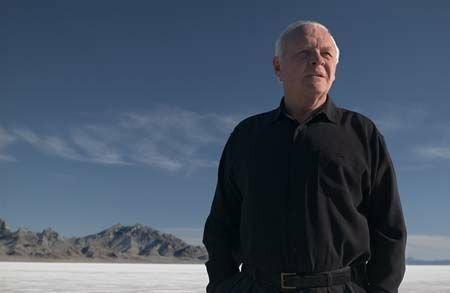 The main character of Burt Munro is played by Anthony Hopkins and although he is an actor I do not rate, in this role he seems to find a different character to the one he usually plays. The accent isn�t great though and it wonders from New Zealand through Norfolk, Northampton and Cornwall before returning to an Antipodean �struth� and �wa�cher mate�, only to whisk himself off to somewhere on the Clyde. If dialects and accents aren�t his forte then bringing Burt Munro to life surely is. So closely did he study the life and character of Munro that his family were moved to tears when they were invited to watch the filming, Hopkins even wearing the tie and some other actual clothing of Burt's. 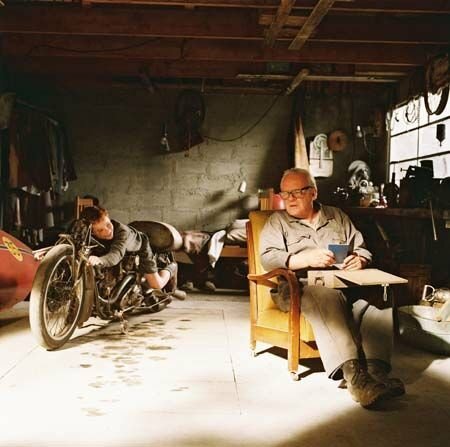 I hate words like �charming� and �delightful� but the story is both and brings every type of emotion to the fore as we follow Munro, living in his shed, building his dream bike in an attempt to take it to the Bonneville Flats in the USA. 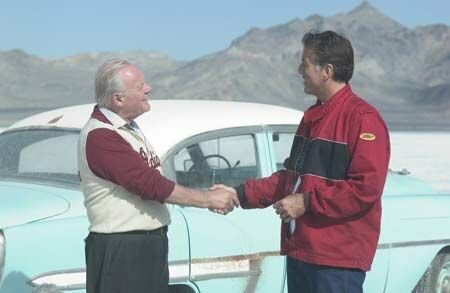 The plot takes Burt all the way to Utah where the famous Race Week is about to take place and we see the many characters that he meets along the way. 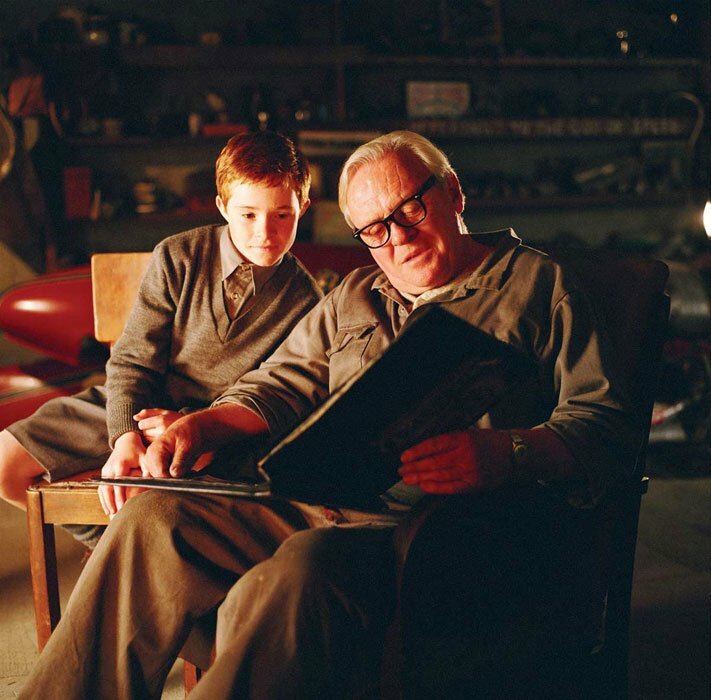 If the film has a low point it has to be when he meets an �old girl� in the shape of Fran (Annie Whittle) and she takes him to see the grave of her husband. I have no idea why this scene was filmed except to pad out Burt's travels and make the film 127 minutes long. It adds nothing to the plot and seems to have little relevance to the story. It only helps to convince the viewer that Mr Munro�s journey may not have been as interesting as studio executives would have wanted. Some of the movies most humorous scenes are where Burt realises all is not quite as it seems in America as he meets characters the like of he has never seen before. It will have you laughing and crying, it will drop you and then lift you up, it has everything you need for a film in this genre and I advise everyone to watch it. Yes it has faults but they are slight and do not detract from the general nostalgic feel and the atmosphere of the time. Make sure you see this film or at least get it on DVD when it becomes available. Hopkins with the Fastest Indian.